It's informative. Even if you never write an actual tweet, the act of reading other people's tweets is enough to keep you informed and up to date on news and ever-changing industries. Most tweets involve current events and topics about things that are constantly evolving - like technology, educational resources, teaching curriculum and methods, local and national news, and the like. It's an outlet. If you tweet a fact or message, it has the potential of reaching millions of people in a matter of minutes. And all it takes is a "retweet" to carry someone else's message across the globe. You get another way to bookmark things that interest you. Unlike web pages that you bookmark as URL's, Twitter allows you to "follow" any company, person, or subject that happens to have a Twitter account. So your newsfeed can entail topics and news catered just for your interests. What the heck is a hashtag? A hashtag'ed word or phrase is essentially a way to flag a topic. If you were looking for help in, say, MATH, you could search the hashtag #math, and a list of tweets would come up. Sort of in the way you'd use your standard search engine online. �A hashtag also allows Twitter to track what people are talking about, so that you're able to see the hot topics of the day. All that being said...think of the times we live in with smart phones and iPads. When a journalist is on the scene of breaking news, all he has to do is type in one simple tweet, and you've been informed before a news anchor has even had time to fix his or her hair for tv! It's just another way to stay on top of your industry and the world. So get tweeting. 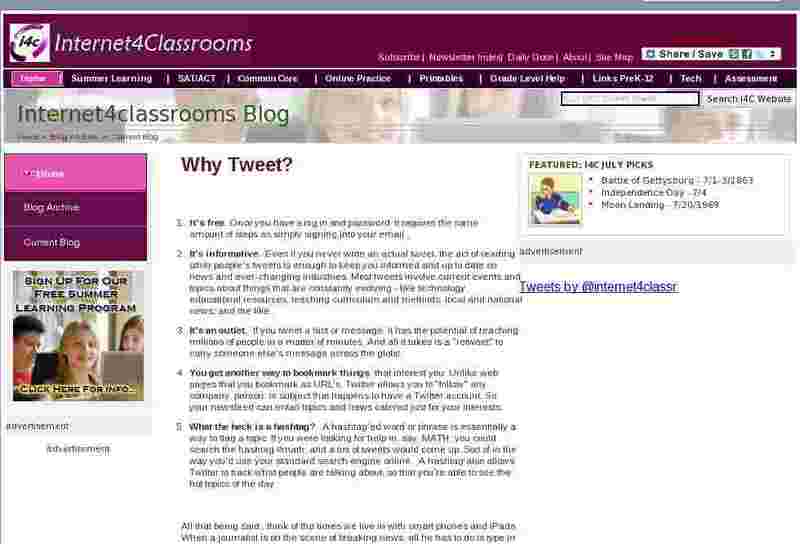 You can follow us on Twitter under Internet4classr.